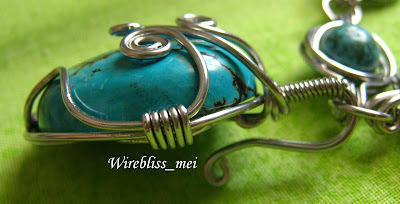 I made another pendant for the turquoise necklace i made last two weeks as i don't seem to be satisfied with them all. 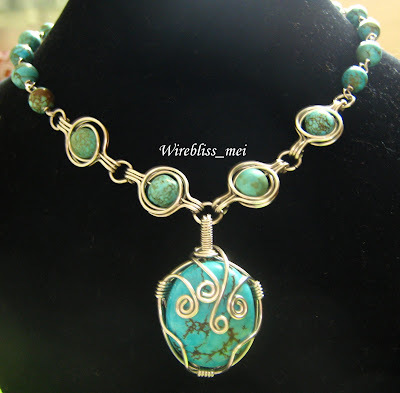 I found this cab last week when i stopped by at the bead shop. Cost me some amount of $$....hehe! Anyway, this one is detachable about an inch from top to bottom and less than an inch across. Used 20g wire for the frame. 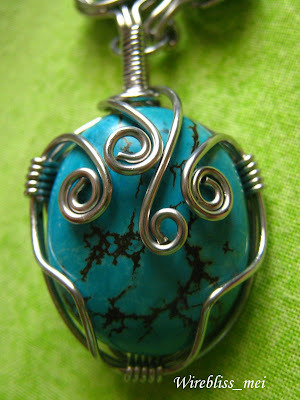 Oh ya for those of you who've been asking me what is the name of this design and this one, and if there is a tutorial for it, I finally found the site where i saw this type of wrap (twice around the world-this name is given to my necklace by someone in the forum i joined). It is here at Bead&Button Show. Don't get me wrong, I am not promoting for them and i have never taken the class before. Just want to share with all of you. Have a nice weekend all.